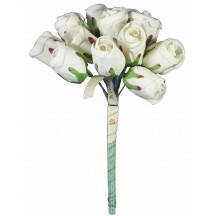 Bunch of 12 beautiful rose buds in white. 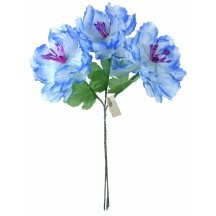 Fabric blossoms are approx. 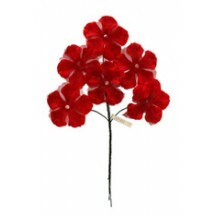 5/8" across x 3/4" tall with 3-1/2" green paper-wrapped wire stems. Some bundles have their original attached paper tags that read "Made in Japan." Bundle of 3 ruffled fabric poppies in blue with a beautiful painted stripe look. Blossoms are approx. 2-1/2" across with one green leaf each and paper-wrapped wire stems. Overall bundle measures 7" long. Some bundles have their original paper tags that read "Made in Japan." 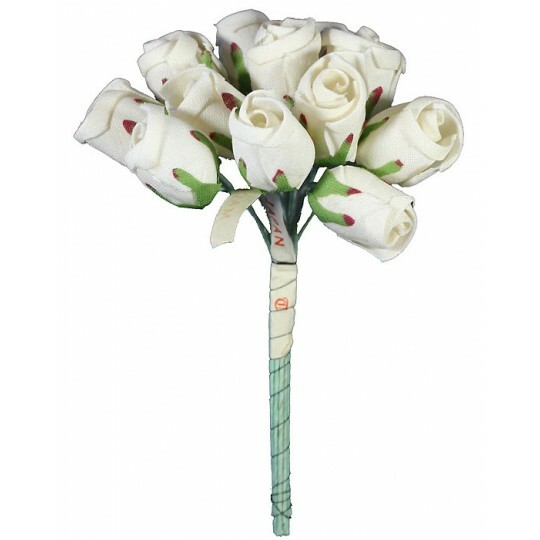 Bundle of old store stock vintage white fabric flowers with handpainted red accents and green stiffened fabric stems. 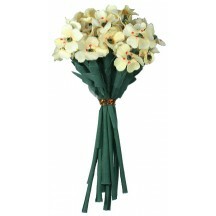 Bundle includes 12 stems with 3 flowers per stem. Blossoms measure 3/4" across; overall the bundle measures 5" tall. Vintage old store stock; some bundles have their original paper "Made in Korea" tags. 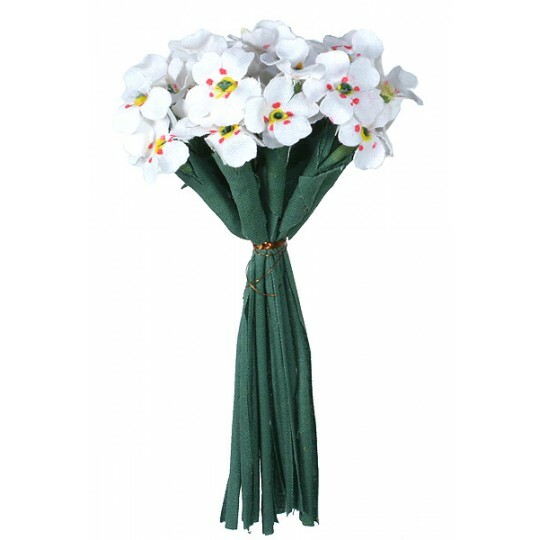 Bundle of old store stock vintage yellow and sunset fabric flowers with handpainted red accents and green stiffened fabric stems. 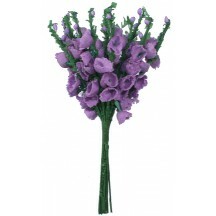 Bundle includes 12 stems with 3 flowers per stem. 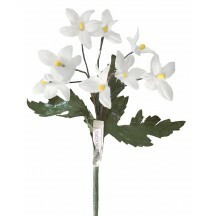 Blossoms measure 3/4" across; overall the bundle measures 5" tall. Vintage old store stock; some bundles have their original paper "Made in Korea" tags. 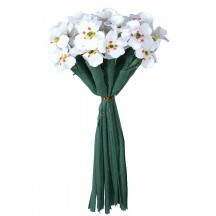 Bundle of old store stock vintage yellow fabric flowers with handpainted red accents and green stiffened fabric stems. 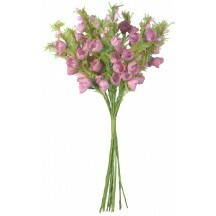 Bundle includes 12 stems with 3 flowers per stem. 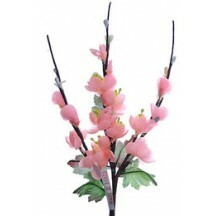 Blossoms measure 3/4" across; overall the bundle measures 5" tall. Vintage old store stock; some bundles have their original paper "Made in Korea" tags. Bundle of old store stock vintage light purple fabric campanula flowers with light green paper leaves. 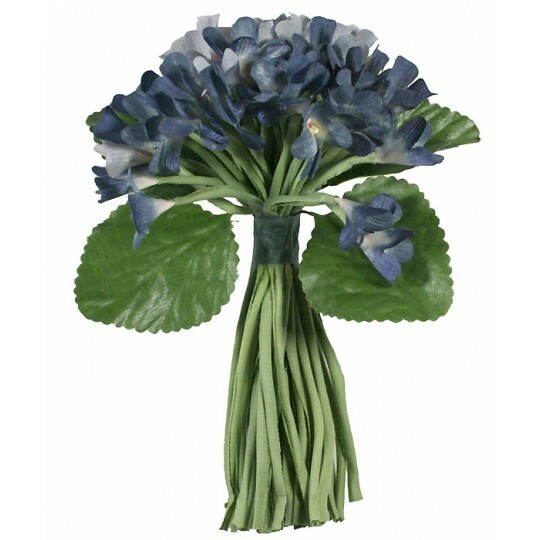 Bundle includes 12 stems that can be easily unbundled. Blossoms measure just over 1/4" across; overall the cluster measures 5" tall. Each stem has approximately 6 flowers. Vintage old store stock. 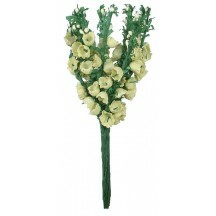 Bundle of old store stock vintage pale yellow fabric campanula flowers with green paper leaves. 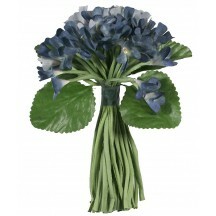 Bundle includes 12 stems that can be easily unbundled. 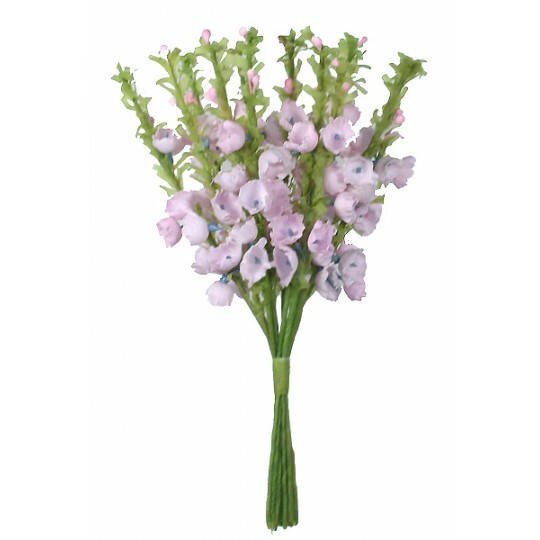 Blossoms measure just over 1/4" across; overall the cluster measures 5" tall. Each stem has approximately 6 flowers. Vintage old store stock. Bundle of old store stock vintage mauve fabric campanula flowers with light green paper leaves. 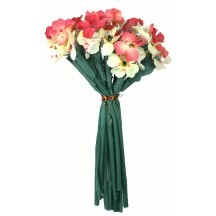 Bundle includes 12 stems that can be easily unbundled. Blossoms measure just over 1/4" across; overall the cluster measures 5" tall. Each stem has approximately 6 flowers. Vintage old store stock. 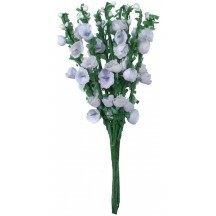 Bundle of old store stock vintage pale purple fabric campanula flowers with green paper leaves. Bundle includes 12 stems that can be easily unbundled. 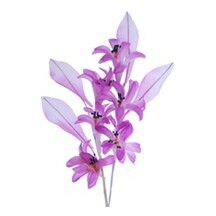 Blossoms measure just over 1/4" across; overall the cluster measures 5" tall. Each stem has approximately 6 flowers. Vintage old store stock. 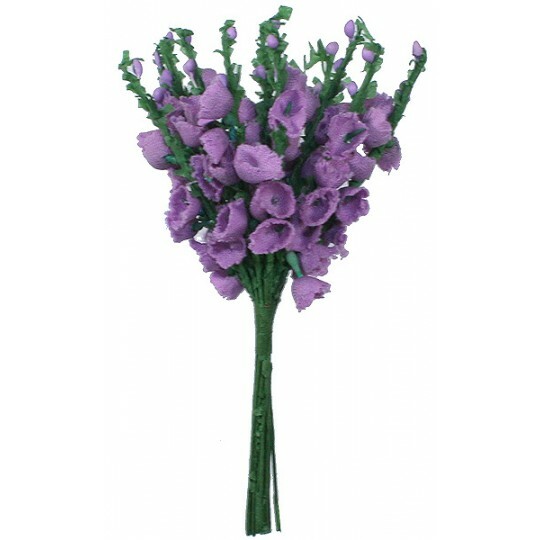 Bundle of old store stock vintage purple fabric campanula flowers with green paper leaves. 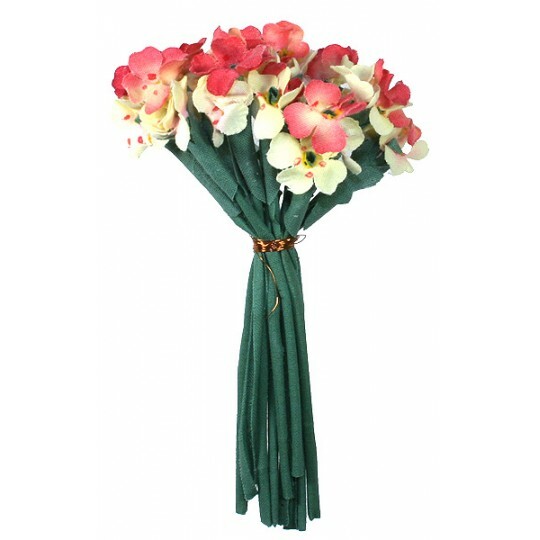 Bundle includes 12 stems that can be easily unbundled. 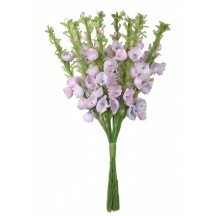 Blossoms measure just over 1/4" across; overall the cluster measures 5" tall. Each stem has approximately 6 flowers. Vintage old store stock. 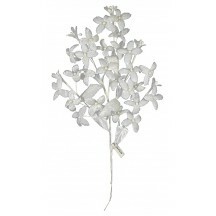 Spray of beautiful velvet flowers in white with white satin and velvet leaves. Velvet blossoms are approx. 1" across and leaves are 1-3/4" long. Spray is approx. 10" long overall. Made in Japan in the 1950s, most sprays have their original "Made in Japan" tags. 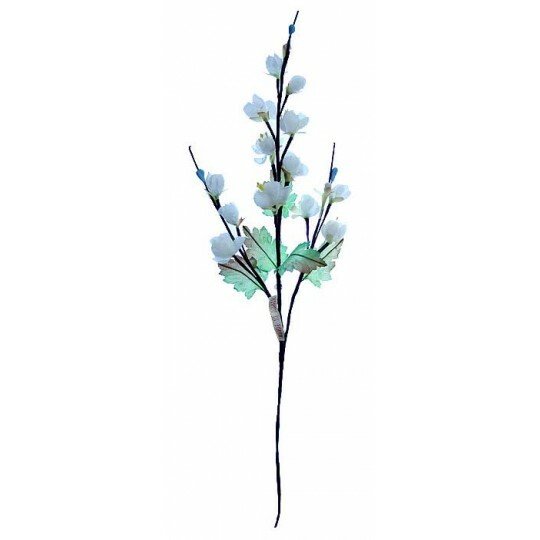 Sprig of four (4) old store stock vintage fabric millinery orchids in pale aqua green with four (4) green leaves. Blossoms measure approx. 2" across and leaves measure 2-1/2" long x 3/4" wide. Most bundles have their original paper tags that read "Made in Japan". 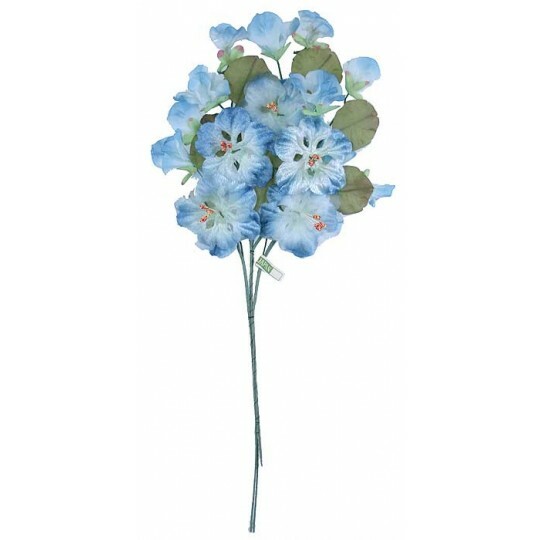 Spray of 6 old store stock vintage light blue fabric morning glory flowers. Each flower measures 1 1/2" across. Bunch measures 5" tall overall. Some have original paper tags that read "Made in Korea." 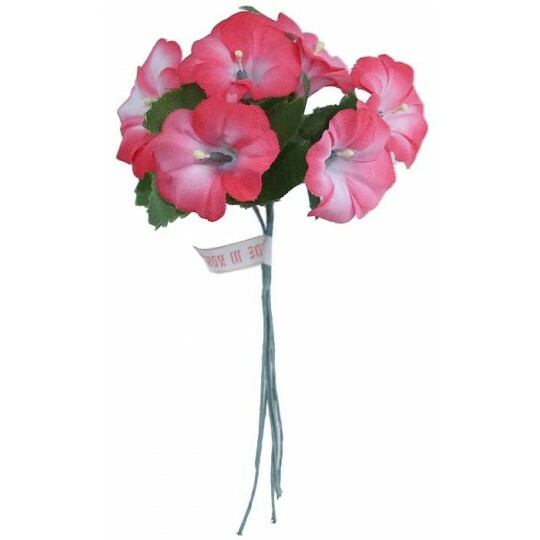 Spray of 6 old store stock vintage light red fabric morning glory flowers. 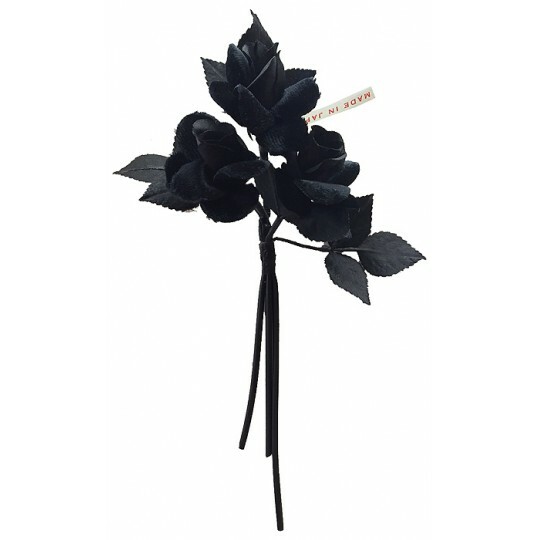 Each flower measures 1 1/2" across. Bunch measures 5" tall overall. Some have original paper tags that read "Made in Korea." 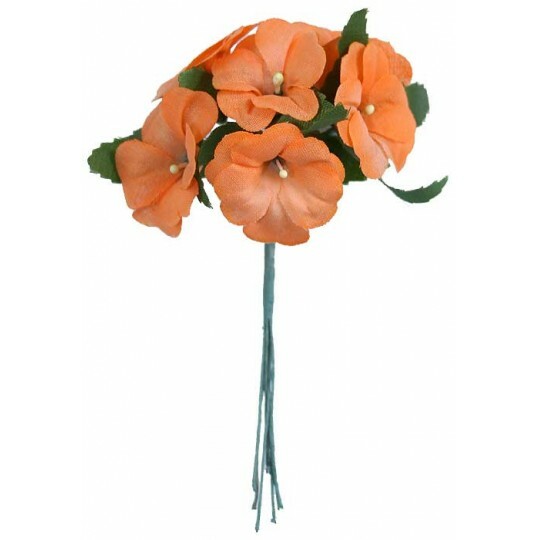 Spray of 6 old store stock vintage peach fabric morning glory flowers. Each flower measures 1 1/2" across. Bunch measures 5" tall overall. Some have original paper tags that read "Made in Korea." 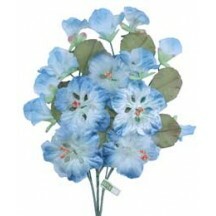 Vintage spray of five velvet and organza nasturtium blossoms with ten green fabric leaves and 10 buds. Blossoms are approx. 1 3/4" across. Spray is approx. 11" overall. Original paper tag reads "Made in Japan." 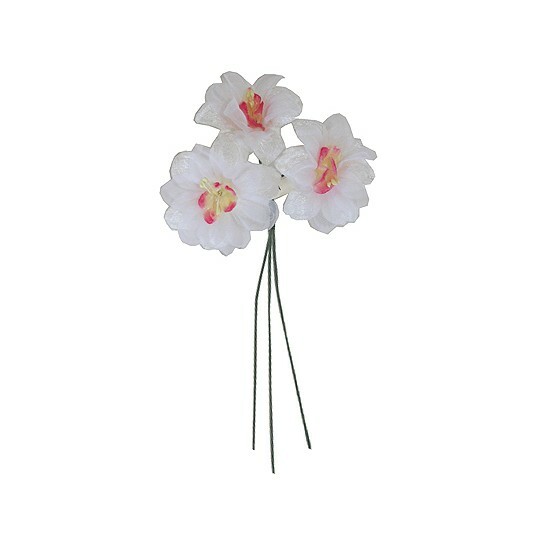 Old store stock vintage bright pink orchid blossom with pale yellow accents. 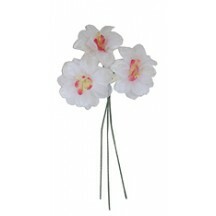 Blossom measures 3 3/4" across and has a white paper wrapped stem measuring 3" long. 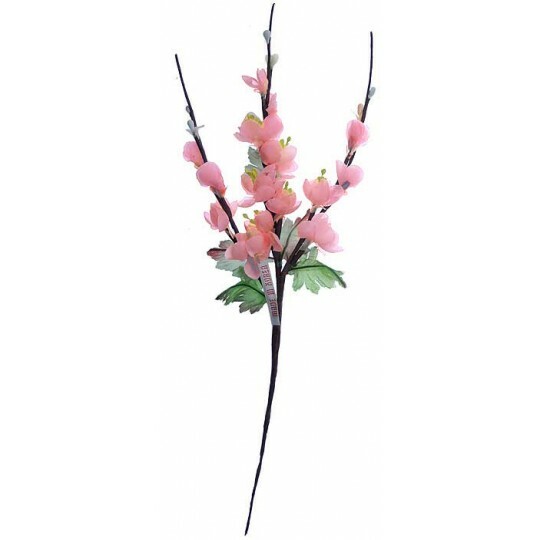 Most blossoms have their original tag that says "Made in Taiwan." Old store stock vintage pale pink orchid blossom with white accents. 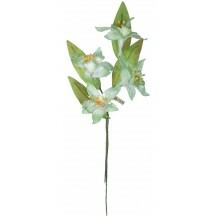 Blossom measures 3 3/4" across and has a white paper wrapped stem measuring 3" long. 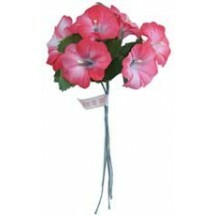 Most blossoms have their original tag that says "Made in Taiwan." Cluster of vintage mixed velvet and fabric roses in deep black. 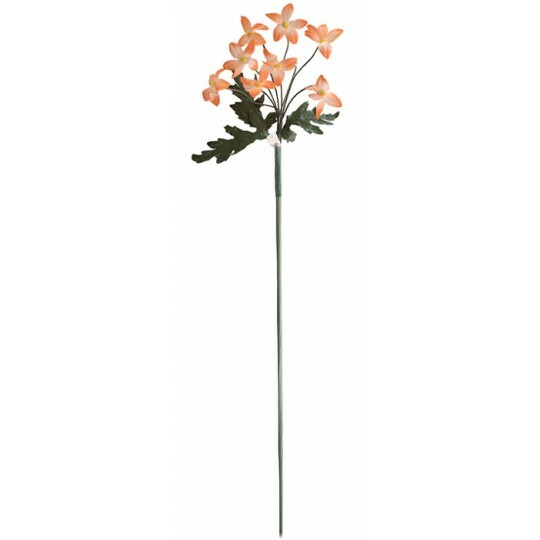 There are 3 blossoms measuring 1-1/2" across on tube stems; leaves measure 1-1/8" long. Overall length of the cluster is 8-1/2". Original paper tag says "Made in Japan". 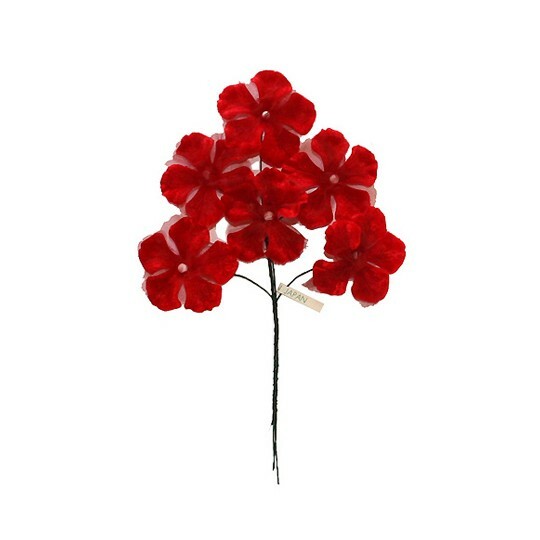 Sprig of vintage embossed velvet and organdy geranium flowers in bright red. 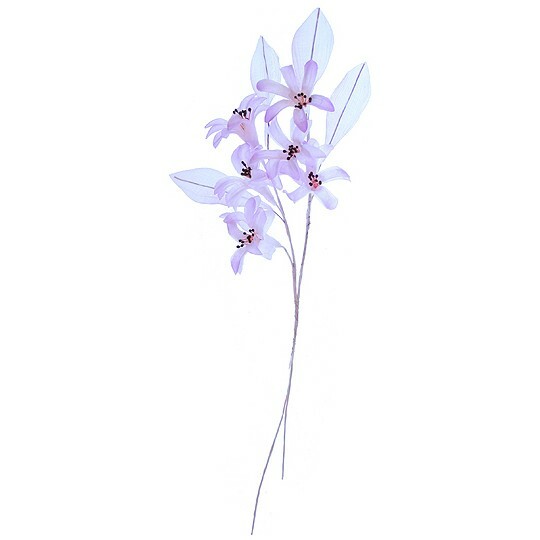 There are 6 blossoms measuring 1 7/8" across on wired stems. 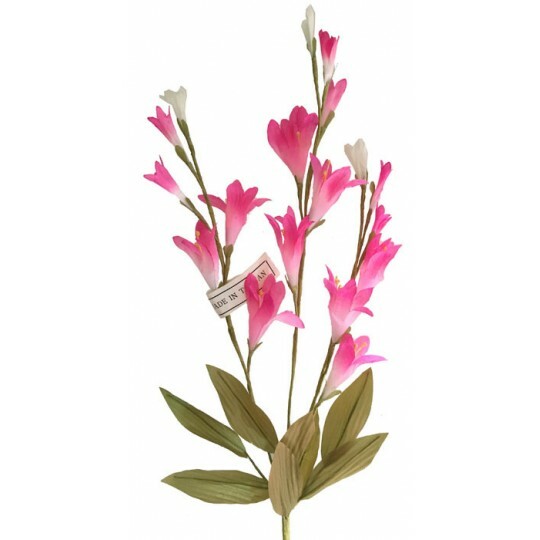 Overall length of the sprig is 7 1/2". Original paper tag says "Made in Japan". 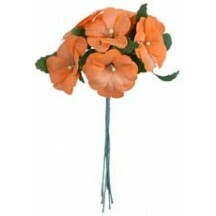 Stalk of 8 old store stock vintage fabric millinery star flowers in orange. Blossoms measure approx. 1" across. Leaves measure 2-1/4" long. Most bundles have their original paper tags that read "Made in Korea". 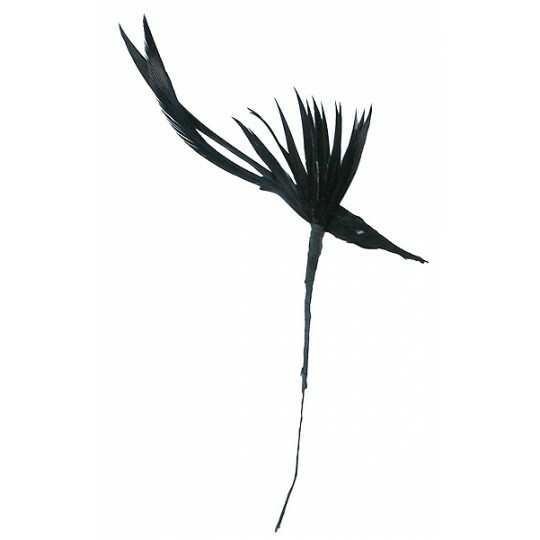 Stalk measures 12" long overall and can be taken apart to get individual flowers, but please note that doing so will result in very short stems. 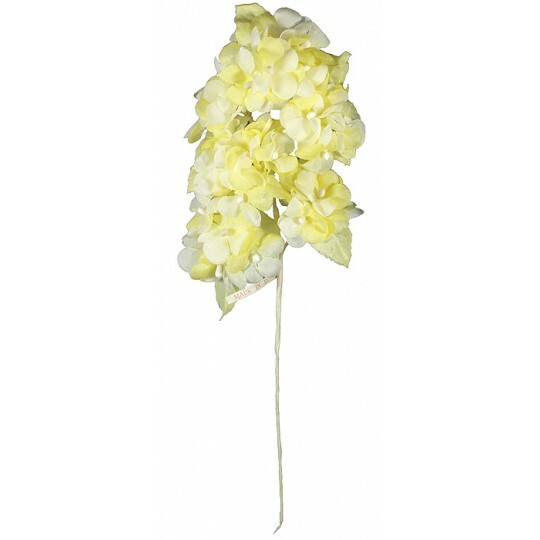 Stalk of 8 old store stock vintage fabric millinery star flowers in yellow. Blossoms measure approx. 1" across. Leaves measure 2-1/4" long. Most bundles have their original paper tags that read "Made in Korea". 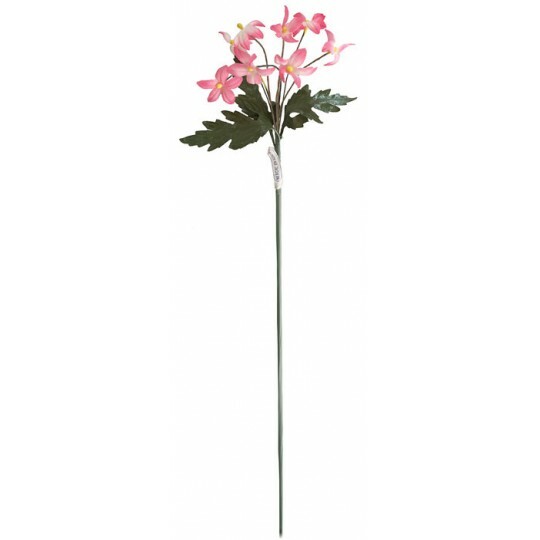 Stalk measures 12" long overall and can be taken apart to get individual flowers, but please note that doing so will result in very short stems. 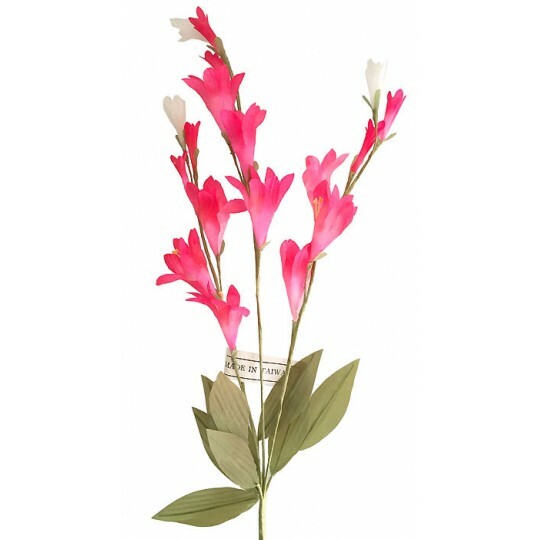 Stalk of 8 old store stock vintage fabric millinery star flowers in pink. Blossoms measure approx. 1" across. Leaves measure 2-1/4" long. Most bundles have their original paper tags that read "Made in Korea". Stalk measures 12" long overall and can be taken apart to get individual flowers, but please note that doing so will result in very short stems. 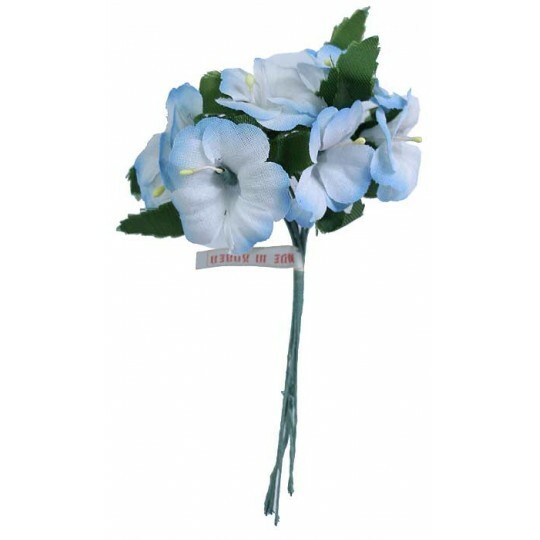 Stalk of 8 old store stock vintage fabric millinery star flowers in white. Blossoms measure approx. 1" across. Leaves measure 2-1/4" long. Most bundles have their original paper tags that read "Made in Korea". 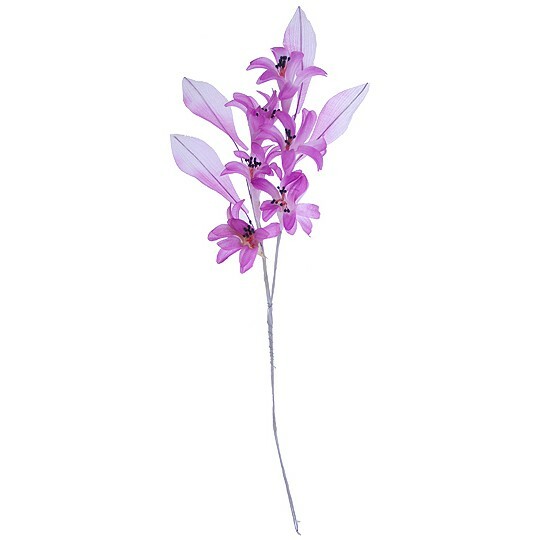 Stalk measures 12" long overall and can be taken apart to get individual flowers, but please note that doing so will result in very short stems. 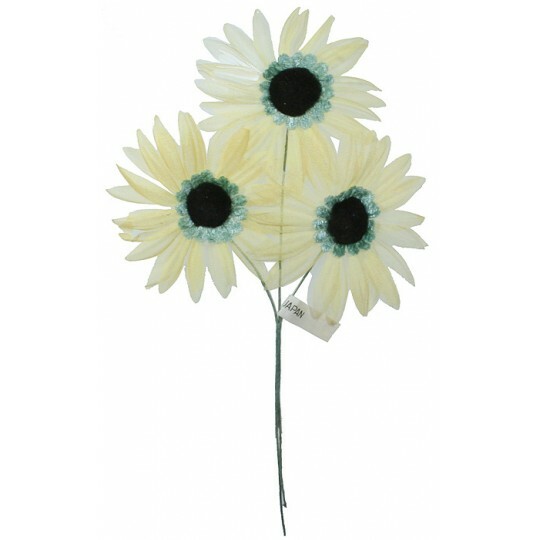 Cluster of 3 large fabric daisy blossoms with aqua velvet and black fuzzy centers. 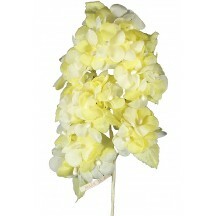 Flower petals are gauzy, light-weight fabric in pale yellow. Blossoms are approx. 3" across with 4" paper-wrapped wire stems. Original paper tag reads "Made in Japan." 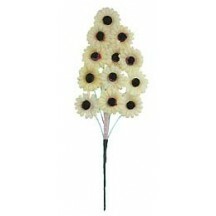 Vintage spray of 12 fabric daisy blossoms with fuzzy centers. Blossoms are approx. 1" across. Spray is approx. 8" overall. Original paper tag reads "Made in Japan." 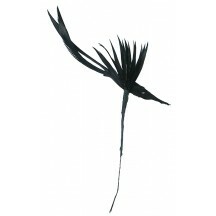 1 unique handmade feather bird in black, measures approximately 2" tall x 4" long on a 3" paper wrapped wire. This is new old store stock, fresh out of a box after more than 60 years. 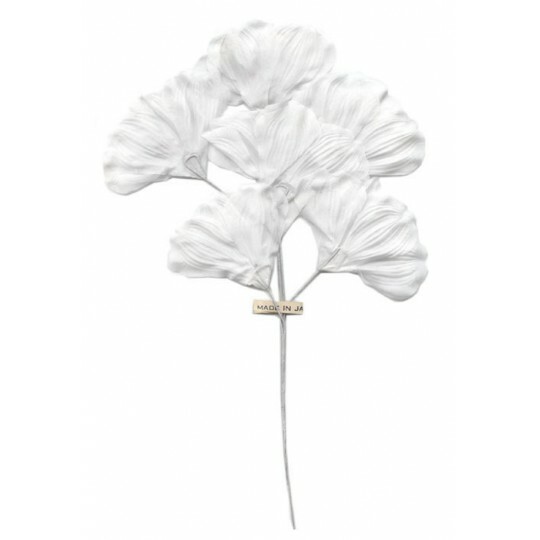 Made in Japan in the 1950s for the millinery trade. Some of them have their original paper "Made in Japan" tags, but not all. Spray of six vintage silk hyacinth blossoms with four silk leaves. Blossoms are approx. 1 1/2" across; leaves are 2 1/4" long. Spray is 11" long overall. Some sprays have their original paper tag that reads "Made in Japan". 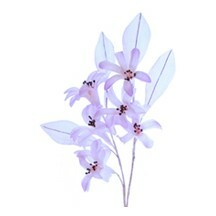 Spray of six vintage silk hyacinth blossoms with four silk leaves in lavender. Blossoms are approx. 1 1/2" across; leaves are 2 1/4" long. Spray is 11" long overall. Some sprays have their original paper tag that reads "Made in Japan". Spray of six vintage silk flower blossoms in pale pink. 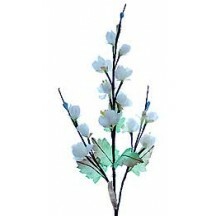 Blossoms are a flat style and approx. 2" long x 3" across. Spray is 9" long overall. Some sprays have their original paper tag that reads "Made in Japan". Spray of six vintage silk flower blossoms in white. Blossoms are a flat style and approx. 2" long x 3" across. Spray is 9" long overall. Some sprays have their original paper tag that reads "Made in Japan". 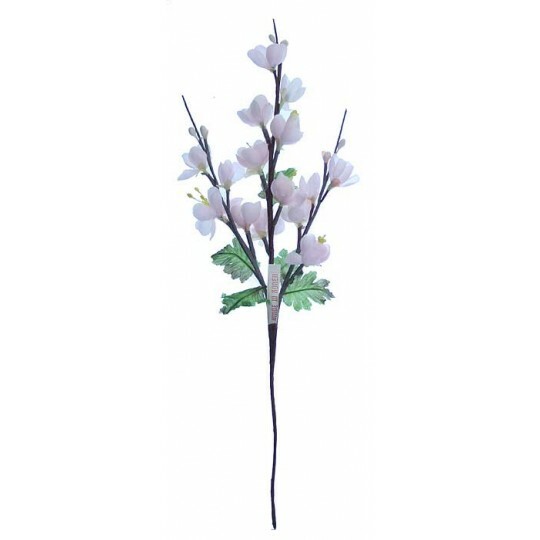 Spray of old store stock vintage light pink fabric cherry blossoms. 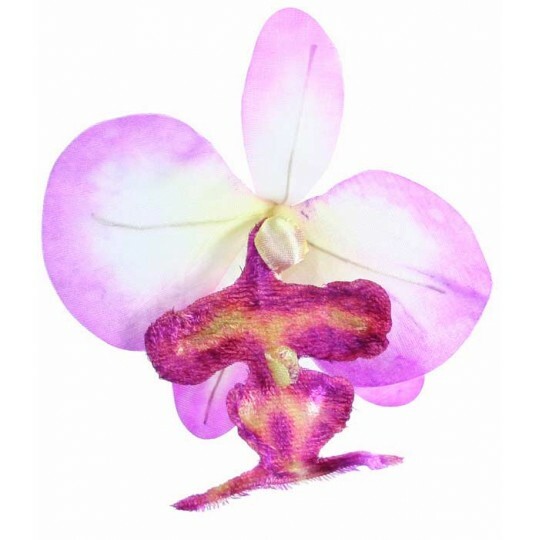 Each flower measures about 1/2" across. Bunch measures 12.5" tall overall. Some have original paper tags that read "Made in Korea." 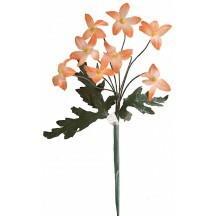 Spray of old store stock vintage peach fabric cherry blossoms. 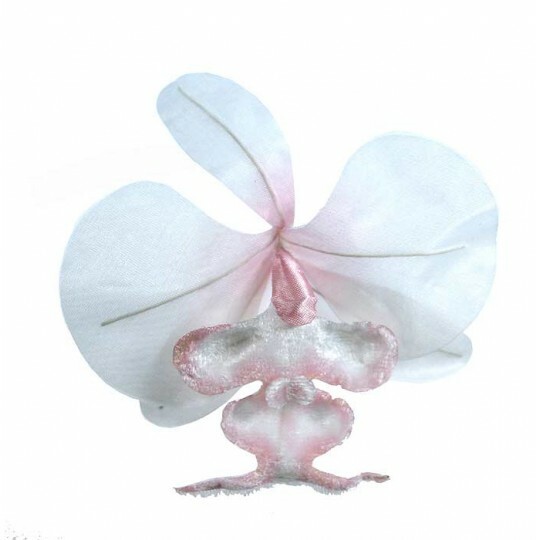 Each flower measures about 1/2" across. Bunch measures 12.5" tall overall. Some have original paper tags that read "Made in Korea." 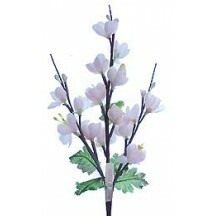 Spray of old store stock vintage white fabric cherry blossoms. 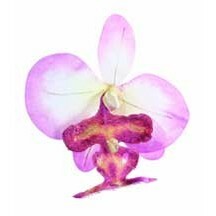 Each flower measures about 1/2" across. Bunch measures 12.5" tall overall. Some have original paper tags that read "Made in Korea." Spray of bright pink and white fabric freesia flowers. 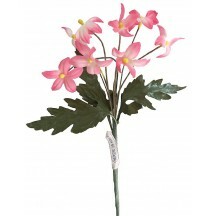 Largest flowers measures 1-1/2" long, leaves measure 2-3/8" long. Spray measures 15-1/2" long overall. Some have original paper tags that read "Made in Taiwan." 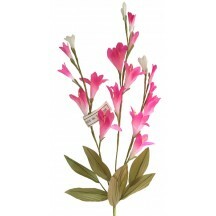 Spray of pink and white fabric freesia flowers. 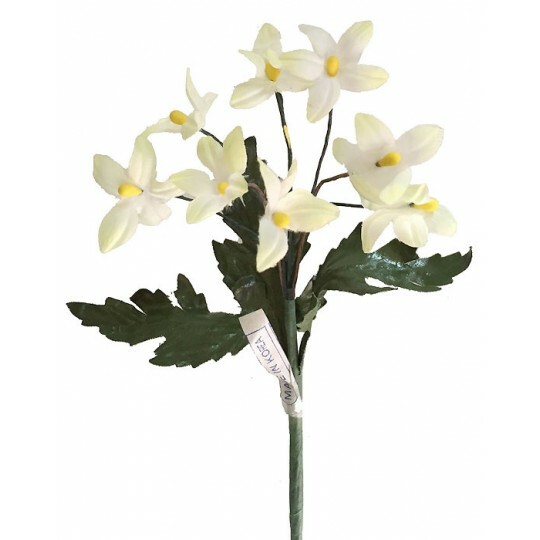 Largest flowers measures 1-1/2" long, leaves measure 2-3/8" long. Spray measures 15-1/2" long overall. Some have original paper tags that read "Made in Taiwan."